Our concentrated certified organic formulation of nourishing oils soothe, protects and promotes skin healing and the therapeutic power of herbs acts as a barrier on your skin’s surface. This moisturizing ointment is rich in compounds that soothe the skin and encourage healing. Great for dry or irritated skin conditions and tattoo aftercare. 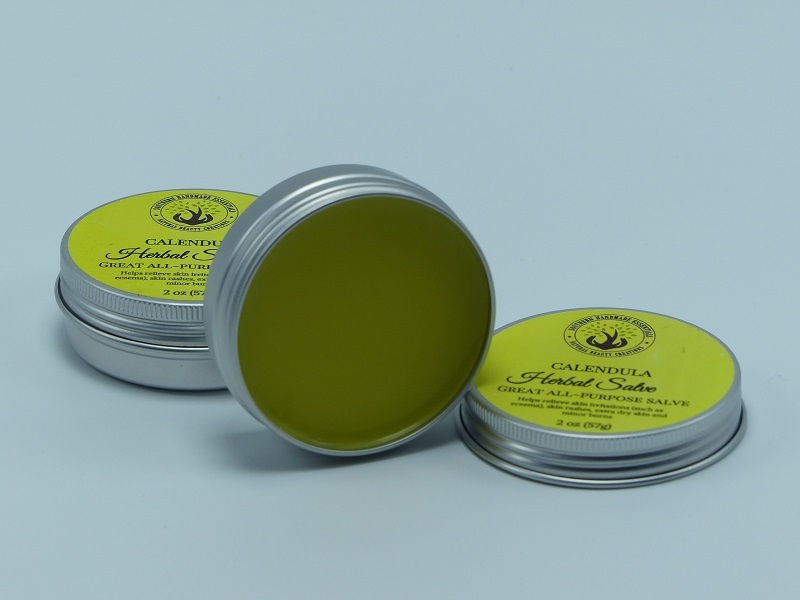 This super soothing organic salve contains the healing herbs of Calendula, Chamomile, and Lavender. Calendula petals is rich in compounds that moisturize, nourish and encourage healing. This plant has been the secret ingredient in many healing balms and skin care products for centuries. But you don’t need a cut, scape or irritated skin to use it. It’s a great handy moisturizer too! Apply liberally as often as needed. Within minutes brings the healing qualities of herbs directly to your skin. I use this for my scar on my neck I had surgery on and it ha worked miracles. I use it every day and night. It soothes my scar and relieves the itching that happens when your scar is starting to heal. I also use it on my lips and it has got rid of the dark marks on my lips as well. I use to only use blistex But now I just use this and it is the best stuff ever. My scar is healing and you cannot even tell that I had surgery and my lips are so smooth. Thank you for your feedback! We appreciate your honest review of our products!